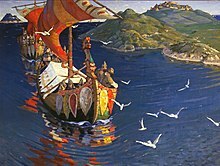 It has been argued that the word Varangian, in its many forms, does not appear in primary sources until the eleventh century (though it does appear frequently in later sources describing earlier periods). 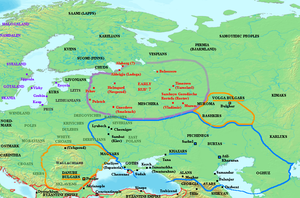 This suggests that the term Rus' was used broadly to denote Scandinavians until it became too firmly associated with the now extensively Slavicised elite of Kievan Rus. 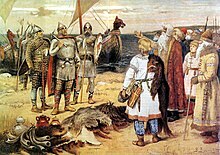 At that point, the new term Varangian was increasingly preferred to name Scandinavians, probably mostly from what it currently Sweden, plying the river-routes between the Baltic and the Black/Caspian Seas. ^ Quoted from National Geographic, March 1985; Compare: Ferguson, Robert (2009). 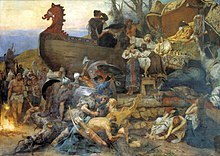 The Hammer and the Cross: A New History of the Vikings. Penguin UK. ISBN 9780141923871. Retrieved 2016-07-25. They have no fields but simply live on what they get from the Slavs' lands. ^ "Rus | people". Encyclopedia Britannica. Retrieved 2019-02-20. 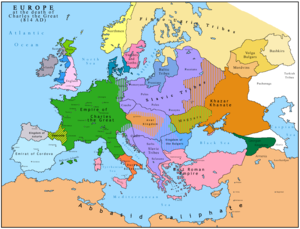 ^ "Treaties Between the Rus and the Byzantine – Eastwards to Miklagard". onlineacademiccommunity.uvic.ca. Retrieved 2019-02-20.